Is it really Friday ALREADY? I know I probably say that every week... But each week Friday comes around and each week I can't believe it's here again! Follow Friday is a weekly bookish meme carried out by Alison Can Read and Parajunkee. This week is a little different! "Today's Question is something new, an activity. We want to see what you look like! Take a pic with you and your current read! Too shy? Boo! Just post a fun pic you want to share." Note: I know the image is mirrored, but I really couldn't figure out how to flip it! Since I've gotten a Macbook I haven't figured everything out yet. So sorry everyone for my noobiness! How fun! I like knowing the face behind a blog! 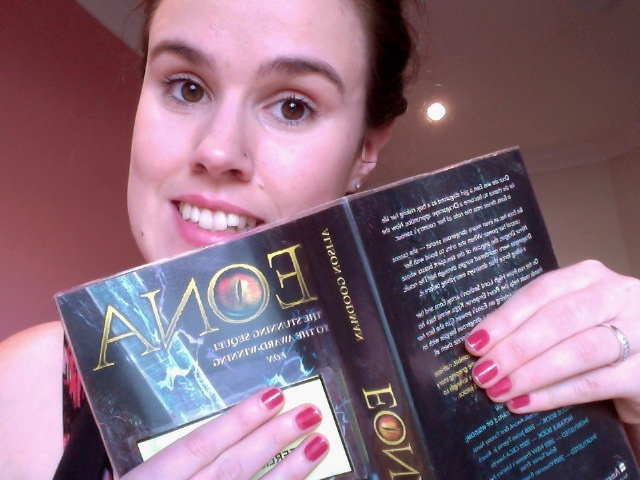 so here is a picture of me with my current read... Eona by Alison Goodman. So far it is really good! Also I have a giveaway coming up, check out the link to let me know what books you would like to see as options to pick from! Not heard of the book you are reading hope you continue to enjoy reading it. The cover looks really interesting, I might check it out :-) And thanks for stopping by, I´m now a follower, too! I haven't heard of that book but it looks great! Hope you enjoy it! Great picture! I haven't heard of Eona, but it looks good. Haha, I like your pic! How are you enjoying Eona? I've heard both good and bad about it. Hopping through. Yay for Eona. I just picked up Eon at the library. I can't wait to start it. I loved Eona! Thought it was a fantastic book. Nice blog, I've never heard of that book but I like the cover. I'm on my way to check that book out on Goodreads. Happy reading! Great picture! I really want to read that series, it sounds awesome! Enjoy! Never heard of the book before. Hope you continue to enjoy it. I am a new follower and a return blogger (LOL) getting into the world of books now and it's fascinating!